We take Mike Trout for granted. It’s not a thing that’s unique to Mike Trout. We take all consistently great baseball players for granted. We take all consistently great anythings for granted. That’s why we’re always trying to figure out the next big thing — it doesn’t take long to get used to the current big thing. Mike Trout, right now, beats the hell out of Gregory Polanco, but Polanco might be of greater current interest, because he’s fresh and he could become a star. Trout’s already been a star for years. This is just part of having a human brain — we acclimate. We’re incredible at it. It has its upsides. Once you start taking a player for granted, though, it’s that much more difficult to really appreciate what the player’s able to do. The best players aren’t guys regularly doing amazing things — the best players are guys regularly doing good things, some percentage more often than the inferior players. Usually those are standard good things. We get to the point where, in order to feel an appreciation, we need something extraordinary. So let’s seize a chance. Feel like you’ve been taking Mike Trout for granted? You’re not alone. Let’s watch him do something extraordinary, to remember that he is extraordinary. 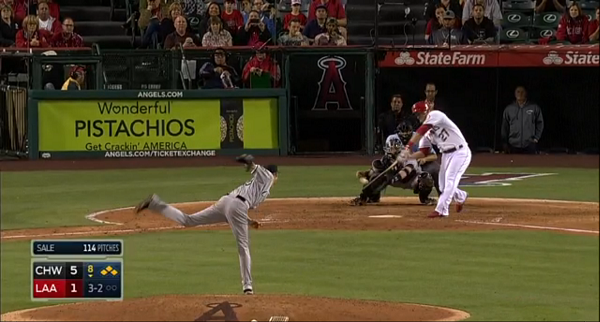 We’re going back to the weekend, when Trout faced off against Chris Sale. They faced off a few times, but, as far as the memories are concerned, they faced off but once, in the bottom of the eighth of a four-run game. Trout batted with the bases loaded, and he and Sale ran all the way to a full count. Sale threw a changeup, and Trout won, and the game was tied in a matter of seconds. The pitch was Sale’s last, and when he returned to the dugout, he grabbed a baseball bat and let out some frustrations in the tunnel. Sale might’ve been mad at himself, but he didn’t have a reason to be. He didn’t so much allow a grand slam as Mike Trout just hit one. About the spot that Sale hit. I looked for pitches in the same spot over the course of the PITCHf/x era. I got ultra-precise and created a location box measuring one inch by one inch, and since 2008, there have been 940 swings by right-handed batters against pitches right there. Of those swings, 40% have missed. Of those swings, one has gone for a home run — Mike Trout’s. So that’s a homer/swing rate of 0.1%. On average, 1.4% of all swings lead to homers. A homer is never the most likely outcome, but for Sale against Trout, a homer was probably the least likely outcome, and still Trout went yard. Here’s a plot of all the right-handed homers since 2008, so you can understand Trout’s homer in more context. I corrected a few measurement errors but I sure as shoot didn’t correct all of them, but you should still get the gist. It’s not the most unusual homer that’s been hit — this might be the most unusual homer that’s been hit. 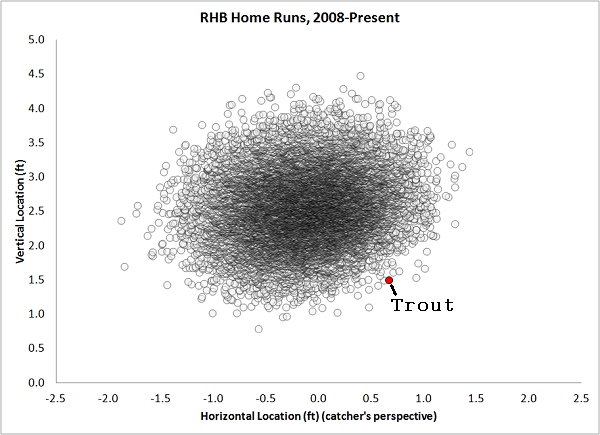 But clearly, there’s the main cloud, then there’s the rest, and Trout’s homer is around an extreme. The closest homer is one hit by Alfonso Soriano, but Trout’s pitch is in an area where few other pitches are. This is an example of where Trout really shines. Dave has noted that Trout has been somewhat vulnerable up in the zone. But, down in the zone, there is no better hitter in either league. Since 2012, Trout has baseball’s highest slugging percentage on pitches down, over the inner third. He has baseball’s third-highest slugging percentage on pitches down, over the middle third. He has baseball’s highest slugging percentage on pitches down, over the outer third. On pitches down and over the plate, overall, Trout has slugged .709. In second is Yasiel Puig, at .617. And Trout doesn’t swing and miss down there very often, which wouldn’t show up in the slugging results. He does the most damage when he hits the ball, and he very often hits the ball, when it’s down but over the plate. It’s not that Trout doesn’t have any weaknesses. He can definitely be exposed up in the zone with good heat. But the same goes for a lot of hitters, and Trout is unbelievable around the knees. You should never want to pitch him down and in. You should never want to pitch him down and centered. And while, usually, down and away is the best location in general, Trout covers that location, too. 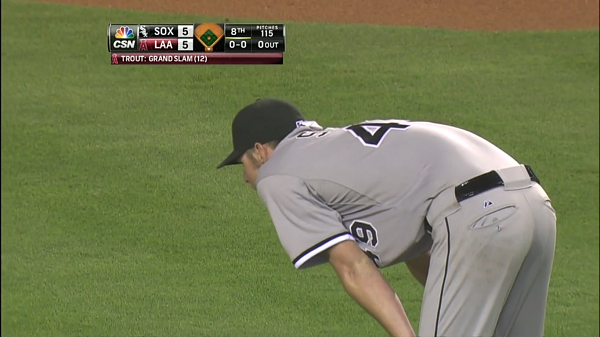 Chris Sale threw exactly the down-and-away changeup he wanted, and it led to the worst possible result. On Monday, Jesse Chavez threw Trout a low-away cutter, and it went for a double that was an on-field homer before a replay review. Mike Trout stands out in a number of ways, but one of them is that a common low-and-away weakness isn’t by any means a weakness of his. Sale shares a division with Miguel Cabrera. He’s faced Cabrera 27 times; he’s faced Trout 13 times. Cabrera, even, has had more success in the matchups. It seems distinctly statheadian to refer to Trout as the best in the league. Or maybe Sale can just see what the rest of us do, using his own two eyes. Mike Trout does an awful lot of good things. Sometimes he does amazing ones. This is most probably because he is amazing. 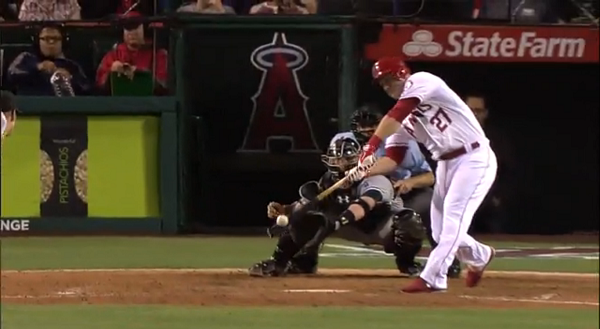 We hoped you liked reading Let’s Watch Mike Trout Do Something Amazing by Jeff Sullivan! How do you guys make these beautiful .gifs? Maybe he did have a reason to be mad at himself. After all, he got into a bases-loaded jam with no place to put Trout, then he pitched to a full count, increasing his odds of being hit. The 3-2 count is a pitchers count. No reason to throw Trout a strike there. Given the score, a walk was not a terrible outcome. Well then, that would be another possible reason for him to possibly be mad at himself.